Keywords: DNA, DNA phantom, wave biocomputer, genome, wave-based genome, quantum holography, bioholography, organismic evolution, vacuum substructure, biophysics, psychobiology, gene expression, psychotherapeutic applications. Hypothesis: The organization of any biological system is established by a complex electrodynamic field which is, in part, determined by its atomic physiochemical components. This field, in turn, determines the behavior and orientation of these components. This dynamic is mediated through wave-based genomes wherein DNA functions as the holographic projector of the psychophysical system - a quantum biohologram. A model of the mind-body relationship is developed in which novel biophysical principles in genome function generate a dynamic possessing attributes consistent with both our psychophysical nature and consciousness. The model invokes a fractal link between neurodynamical chaos and quantum uncertainty. Transactional wave collapse allows this link to be utilized predictably by the excitable cell, in a way which bypasses and complements formal computation. The formal unpredictability of the model allows mind to interact upon the brain, the predictability of consciousness in survival strategies being selected as a trait by organismic evolution (King, 2001). This quantum evolution is orchestrated by the information transduction of DNA. The Gariaev group (1994) has proposed a theory of the Wave-based Genome where the DNA-wave functions as a Biocomputer. They suggest (1) that there are genetic "texts", similar to natural context-dependent texts in human language; (2) that the chromosome apparatus acts simultaneously both as a source and receiver of these genetic texts, respectively decoding and encoding them; (3) that the chromosome continuum acts like a dynamical holographic grating, which displays or transduces weak laser light and solitonic electro-acoustic fields. The distribution of the character frequency in genetic texts is fractal, so the nucleotides of DNA molecules are able to form holographic pre-images of biostructures. This process of "reading and writing" the very matter of our being manifests from the genome's associative holographic memory in conjunction with its quantum nonlocality. Rapid transmission of genetic information and gene-expression unite the organism as holistic entity embedded in the larger Whole. The system works as a biocomputer -- a wave biocomputer. The quantum nonlocality of the genetic information is fundamental. Experimental work of the Gariaev group shows how quantum nonlocality is directly related to laser radiation from chromosomes (coherent light), which jitterbugs its polarization plane to radiate or occlude photons. DNA and the genome have now been identified as active "laser-like" environments. Roughly speaking, DNA can be considered as a liquid crystal gel-like state that acts on the incoming light in the manner of a solitonic lattice. A soliton is an ultra stable wave train that arises in the context of non-linear wave oscillation. The DNA reading process can be modeled as a complex mechanical oscillator capable of producing solitonic wave transmissions. DNA, modeled as a kind of rotary pendulum can be simulated as a chain of non-linear oscillators. Complex dynamic patterns arise when taking into account the non-linear covalent connections between nucleotides. The same researchers suspect the ability of chromosomes to transform their own genetic-sign laser radiations into broadband genetic-sign radio waves. The polarizations of chromosome laser photons are connected nonlocally and coherently to polarizations of radio waves. (Thus, we seem to have an explicit physical analogue for the traditional mystical apprehension of "inner light" and the "audible life stream"). This is the main information channel of DNA, the same for both photons and radio waves. Superposed coherent waves of different types in the cells interact to form diffraction patterns, firstly in the acoustic domain, secondly in the electromagnetic domain -- a quantum hologram -- a translation process between acoustical and optical holograms. In Languages of the Brain (1971), Pribram postulated a neural hologram made by the interaction of waves in the cortex, which in turn is based on a hologram of much shorter wavelengths formed by the wave interactions on the sub-atomic level. Thus, we have a hologram within a hologram, and the interrelatedness of the two somehow gives rise to our sensory images. Bohm (1980), in Wholeness and the Implicate Order went further, declaring the brain is a hologram interpreting a holographic universe. In a holographic model this inseparable interconnectedness begins at the even more fundamental level of human existence, rooted in our existential blueprint, DNA. The brain is a hologram, enfolded within our holographic mind-body, enfolded within a holographic universe. Recent discoveries by Russian scientists Peter Gariaev & al. and later speculations by Vladimir Poponin shed tremendous light on our proposal that the human being is a transducer of universal energy and consciousness -- essentially a biocomputer. The new feature of this research is the ability to physically demonstrate subtle fields emerging from the quantum foam or vacuum potential. This makes the effect quantifiable and measurable -- objective. This takes the phenomenon and subjectivity of consciousness out of the realm of quantum metaphysics and plants it firmly under the rubric of hard science. It heralds the unification of quantum mechanical and chaotic dynamics in human consciousness. We can now model the human bio-computer. Poponin (1995) boldly suggests that this deeper understanding of the mechanisms underlying subtle energy phenomena include many of the observed alternative healing phenomena and includes a physical theory of consciousness. This hypothesis is based on a precise quantitative background and combines both quantum mechanics and complexity or chaos dynamics in a startling and compelling new way. It posits that some new field structure is being excited from the physical vacuum by an intrinsic ability that emerges through DNA. Gariaev discovered the DNA Phantom Effect in 1985, when he worked in correlation spectroscopy of DNA, ribosomes and collagen in the Institute of Physics, in the Academy of Science of the USSR. He was first able to publish his results in 1991, leading to a book in 1994, Wave Based Genome. His DNA Phantom Effect demonstrates a dynamic new field in the vacuum substructure by bombarding it with coherent laser light and coupling it to conventional electromagnetic fields. The experimental protocols for this procedure are rigorous, and have been reproduced in Moscow and at Stanford. R. A. Miller, I. Miller, and B. Webb (2001) are now consulting on the project to suggest the next research directions and applications. Miller and Webb have a long-standing background in this field. Long before David Bohm published his Wholeness and the Implicate Order (1980), Miller and Webb published "A Holographic Concept of Reality" in the journal Psychoenergetic Systems, ed. Stanley Krippner, Vol. 1, 1975. 55-62. Gordon & Breach Science Publishers Ltd., Great Britain. "Holographic Concept" was later reprinted in the book Psychoenergetic Systems, S. Krippner, editor. 1979. 231-237. Gordon & Breach, New York, London, Paris. It was reprinted again in the journal Psychedelic Monographs and Essays, Vol. 5, 1992. 93-111. Boynton Beach, FL, Tom Lyttle, Editor. This foundational paper was followed shortly by "Embryonic Holography: An Application of the Holographic Concept of Reality", also in 1973. Presented at the Omniversal Symposium, California State College at Sonoma, Saturday, September 29, 1973. Reprinted in Lyttle's journal Psychedelic Monographs and Essays, Vol. 6, 1993. 137-156. Miller followed this project with a proposal prepared for the government through Mankind Research Unlimited, described in a formerly unpublished, proprietary paper called "Bioluminescence, Kirlian Photography and Medical Diagnostics" (1974), which is only now seeing the light of day. It was an application of his paper on "The Physical Mechanisms of Kirlian Photography." In 1993, Iona Miller published "The Holographic Paradigm and the Consciousness Restructuring Process," another application to psychotherapeutic mindbody healing. Subsequently she has published extensively on the role of complex dynamics in relationship to consciousness and process-oriented psychotherapy, through Asklepia Foundation. A deep interest in the nature of Synergetics (Fuller, 1975), zero-point field, the vacuum potential, and quantum foam has led her to develop innovative applications of chaos theory in consciousness studies. She has dovetailed many of those discoveries with the reports of mystics of their intuitive inner-plane experiences of Light and Sound (Shabd) throughout history (Singh, 1979; Blavatsky, 1987; Puri, 1964; Miller and Miller, 1983). Could it be that these mystics somehow perceive holographic processes when they look inside themselves? Endogenous DMT (N,N-dimethyltryptamine) is described as the source of visionary light in transpersonal experiences. Its primary source, the pineal, has traditionally been referred to as the Third Eye. DMT production is particularly stimulated, according to Strassman (2001), in the extraordinary conditions of birth, sexual ecstasy, childbirth, extreme physical stress, near-death, and death, as well as meditation. Pineal DMT also plays a significant role in dream consciousness. How might meditation evoke the pineal DMT experience? "Meditative techniques using sound, sight, or the mind may generate particular wave patterns whose fields induce resonance in the brain. Millennia of human trial and error have determined that certain "sacred" words, visual images, and mental exercises exert uniquely desired effects. Such effects may occur because of the specific fields they generate within the brain. These fields cause multiple systems to vibrate and pulse at certain frequencies. We can feel our minds and bodies resonate with these spiritual exercises. Of course, the pineal gland also is buzzing at these same frequencies. The pineal begins to "vibrate" at frequencies that weaken its multiple barriers to DMT formation: the pineal cellular shield, enzyme levels, and quantities of anti-DMT. The end result is a psychedelic surge of the pineal spirit molecule, resulting in the subjective states of mystical consciousness." (Strassman, 2001). But these philosophical aspects are best addressed further elsewhere. Here, in this presentation, the joint work of decades by Miller, Miller and Webb comes to fruition and perhaps finds a physical proof. The organization of any biological system is established by a complex electrodynamic field. This em field is, in part, determined by its atomic physicochemical components and, in turn, determines the behavior and orientation of these components. The holographic model of reality emerging from this principle provides a scientific explanation of psychoenergetic phenomena, (Miller, Webb, Dickson, 1973). In 1973, Miller and Webb suggested bioholograms as the projectors of our material reality: in the nuclei of each cell in the human body, the DNA (deoxyribonucleic acid) carries the structure of our whole body. Not just our physical form, but also the processes that that form undergoes in terms of survival. If all of these things are in truth locked in the DNA, how does that turn into a functioning being? The DNA could possibly be the holographic projectors. The DNA could be projecting a field that would be experienced by other DNA in the body. The DNA molecules, in a sense, could be linked together. The DNA molecules are also linked to their own cell, which they are controlling via mechanisms of RNA transfer and enzymatic action in the cell. We believe that it is likely that the DNA and the RNA are in non-local communication. It is known from the EPR phenomenon that entangled photons retain a mutual informational bond even at a distance, through polarization, and allow a kind of quantum teleportation, which has finally been experimentally verified. DNA molecules, included in chromosomes, possess a substance--wave duality which is similar to the dualism of elementary particles. In accordance with it, DNA codes an organism in two ways, both with the assistance of DNA matter and by DNA sign wave functions, including coding at its own laser radiation level - . The genetic apparatus can be non-local at the molecular level (holographic memory of a chromosome continuum) and at the same time quantum mechanically non-local in compliance with the Einstein-Podolsky-Rosen effect . The latter means that the genome genetic and other regulatory wave information is recorded at the polarization level of its photons and is non-locally (everywhere and in no time) transferred (plays out) throughout the entire space of a biosystem by the polarization code parameter. This helps to set a quick-response information contact among the billions of cells constituting an organism. The genome on the whole and the individual nucleus of cells can generate and recognize text-associative regulatory structures with the application of a background principle, holography and quantum non-locality. (Gariaev, et al, 2000). We believe that the DNA is the projector of the biohologram, both at the cellular level and at the whole-organismic level. This means that the DNA creates a situation of a complex pattern of three-dimensional electromagnetic standing and moving wave fronts in the space that the organism occupies. Other researchers soon obtained similar results, and not only based on photons. Multi-frequency physical fields are now teleported. Based on this data, it’s possible to suppose that photon fields, emitted by chromosomes as sign fields, can be teleported within or even outside the organism’s space. The same is true for wave photon fronts, which were read from the chromosome continuum similar to reading from a multiplex hologram. If photons are transformed into radio waves (the situation we found - ref. to [8, 33,37]) through the EPR-mechanism, then this phenomenon is vital. In fact, the importance of quantum non-locality existence for a genome is hard to overestimate. (Gariaev, et al, 2001). We think that these wave fronts interact with, interpenetrate with, and interdetermine the physical substance that makes up the physical creature. According to the holographic model of reality, all the objects we can observe are three-dimensional images formed of standing and moving waves by electromagnetic and nuclear processes. All the objects of our world are three-dimensional images formed electromagnetically, i.e. holograms. Just like a hologram encodes a 3-D image, the biohologram encodes and projects the blueprint of the human being, as well as other biological systems. We also believe that the nervous system constitutes a coordination mechanism that integrates DNA projections of the rest of the cells in the system, that it is first and foremost a coordination mechanism which aligns these cellular holograms. Imagine the information pleroma, beyond energy and matter, as the source of all infinitely coherent light, “shining” itself into its own entropic womb where our temporo-spatial universe is given its life-potential as a single laser beam. The DNA in a particular cell is not totally active. It has been determined that there may be as little as 1% of the DNA present in the nucleus of the cell acting as the determinant for the structure of that cell. The nervous system, interestingly enough, has the highest percentage of operating DNA of any cell system in the body, of up to at least 10% of the DNA in the brain cells. The neuron nuclei are most active. We suggest that the nervous system projects a global biohologram which interacts with the cellular bioholograms. If the membrane structure of the neuron nuclei is examined closely, it will be seen that the different cavity systems that enter the outer membrane also enter the inner membranes, therefore topologically, these are one and the same. Hence the nucleus is lacking a membrane, or the neurons are lacking a membrane in the sense that two of their membranes are topologically one. We suggest that the neurons are not actually brain cells as such. We believe that the brain is the cell, and the neurons are like a distributed nucleus for that cell. That makes the glial cells organelles in the giant brain-cell. But they are also cells in their own right, much more so than neurons are. We believe the glial cells are infinitely involved with the biohologram, in its projections, and its coordination. To go further, the biohologram, projected by the brain, creates standing and moving electromagnetic wave patterns at different frequencies of the spectrum in order to effect different biochemical transformations. There may be specific electrostatic fields, or there may be electrodynamic fields varying at various frequencies, from low (radio waves) all the way up the spectrum into visible light and beyond. Another process of holography is called "acoustical holography". Acoustical holography employs sound waves to create a movement on a surface that is used as the basis for creation of an optical hologram. So we essentially convert between a pattern of sound waves reflected off an object in space into a pattern of light waves that can reconstruct the shape of that object. We have a transformation between two levels of vibration, two media as it were, preserving a pattern in space. (Miller and Webb, 1973). We suggest that this happens to a much greater degree in the DNA control of our bodies. The liver, for example, contains special function cells. The special function of the liver cells is created by the influence of the projection of the liver pattern on the DNA in the cells in the area where the liver is created. We are suggesting an important feedback mechanism between the activation of the DNA in a particular cellular tissue type that causes it to be that tissue type, and the biohologram being projected by the nervous system. This is bioholography. Returning to the recent Russian discoveries (Gariaev, and reporter Poponin), which seem to confirm the seminal discovery of Miller and Webb: both quantitative and qualitative data are crucial for the development of a new unified nonlinear quantum field theory which includes the physical theory of consciousness. The DNA phantom field effect may be interpreted as a manifestation of a new physical vacuum structure which has been previously overlooked. It is perhaps a specific example of a more general category of electromagnetic phantom effects. Results of the experiments as described by Poponin showed that when DNA was placed in a scattering chamber and bombarded with laser light a "phantom" was revealed, even when the DNA itself had been removed. The DNA was bombarded with weak coherent laser radiation in two frequencies; the intensity of the scattered light was measured, as well as non-linear localized excitations. The experimental team found a surprising effect while measuring the vibrational modes of DNA in solution using a sophisticated “MALVERN” laser photon correlation spectrometer (LPCS), which tests the fluctuation dynamics of DNA solutions. “In each set of experimental measurements with DNA samples, several double control measurements are performed. These measurements are performed prior to the DNA being placed in the scattering chamber. When the scattering chamber of the LPCS is void of physical DNA, and neither are there any phantom DNA fields present, the autocorrelation function of scattered light looks like the one shown in Figure 2a. This typical control plot represents only background random noise counts of the photomultiplier. Note that the intensity of the background noise counts is very small and the distribution of the number of counters per channel is close to random. Figure 2b demonstrates a typical time autocorrelation functions when a physical DNA sample is placed in the scattering chamber, and typically has the shape of an oscillatory and slowly exponentially decaying function. When the DNA is removed from the scattering chamber, one anticipates that the autocorrelation function will be the same as before the DNA was placed in the scattering chamber. Surprisingly and counter-intuitively it turns out that the autocorrelation function measured just after the removal of the DNA from the scattering chamber looks distinctly different from the one obtained before the DNA was placed in the chamber. . . Two conditions are necessary in order to observe DNA phantoms. The first is the presence of the DNA molecules and the second is the exposure of the DNA to weak coherent laser radiation.” (Poponin). Researchers hypothesize that some new field structure is being excited from the physical vacuum substructure. As long as the chamber is not disturbed, it is measurable for long periods of time. What is measured is light scattering from the DNA phantom fields. What is attained is qualitative and quantitative information about the nonlinear dynamical properties of the phantom DNA fields. Its origin is related to physical DNA. As yet, they have found no other substance which recreates or emulates the effect of the DNA molecule. It is this model which suggests a more general nonlinear quantum theory which may explain many of the observed subtle energy phenomena and might lead to a physical theory of consciousness. This suggests that the electromagnetic phantom effect is a more fundamental phenomenon which can be used to explain other observed phantom effects, though not to be confused with the often misinterpreted secondary emission of electrons seen in Kirlian Photography and dubbed "phantoms." [ref. R.A. Miller on "The Physical Mechanisms of Kirlian Photography," Psychoenergetic Systems, Stanley Krippner, ed., 1974]. Evidence suggests a relationship to the phenomena of [endogenous] bioluminescence, liquid crystals, and superconductivity, which we intend to pursue, elsewhere. Bioluminescence can be considered an indicator of life activity. It is the emission of photons of light produced when certain energized electrons drop into a lower or ground state. A common example is the visible light (or electromagnetic radiation) generated by the firefly. The importance of this phenomenon is seen by taking the broad view of the life process as we know it: photons from the sun excite electrons here on earth; this high energy state is transformed into high energy phosphate bonds by the process of photosynthesis; the release of the energy stored in these bonds is the fuel of life; electrons are transferred between molecules in a downward cascade fashion to lower energy states; this action produces the electric current that produces the motion that we call life. (Miller, 1974). Entities can also luminesce at higher frequencies than the normal visible spectrum, such as in the UV or microwave region. 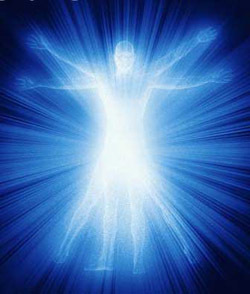 It has been shown that the human being is an emitter of various electromagnetic radiations. Different emissions correspond to different body structures across the emission spectrum. These electromagnetic radiations are of course indicative of the energy state of the organism, and can be indicative of the state of health. Other research (Childre, 1992; Paddison, 1992; King, 2001) suggests that consciousness is non-localized in the bodymind. Joseph Chilton Peace in his latest, The Biology of Transcendence: A Blueprint of the Human Spirit, (2001) points out that we have five neural centers or brains--and establishes that our fourth and most recently developed brain is located in the head while the fifth is located in the heart. It is the dynamic interaction of this head brain (intellect) and heart brain (intelligence), of biology and spirit, which allows transcendence from one evolutionary place to the next. Pearce declares we are quite literally, made to transcend. He says, "Transcendence is our biological imperative, a state we have been moving toward for millennia." In less scientific and more mystical terms, we emerge through self-organization from the Void and to the Void we can return for renewal and sustenance. It is, in fact the Heart Sutra that informs us that "Form is not other than Void; Void is not other than Form." Our human form is not other than this void, and biophysics now demonstrates this quantitatively and qualitatively. We are more fundamentally electromagnetic, rather than chemical beings. The void state, "cosmic zero," is the primal matrix and proportionately our most fundamental reality. In essence, we emerge from pre-geometrically structured nothingness, and DNA is the projector of that field which sets up the stress gradients in the vacuum or quantum foam to initiate that process of embryonic holography, (Miller and Webb, 1973-93). The holographic paradigm is one of reciprocal enfolding and unfolding of patterns of information. All of the potential information about the universe is holographically encoded in the spectrum of frequency patterns that constantly bombard us. We can imagine that the self-organizing emergent function of the “rippling” effects of immense numbers of criss-crossing interference waves must be one way of making mutually interactive, or reciprocal, holographic projections of holographic projections. Our DNA projects our psychophysical self, and likewise “our brains mathematically construct objective reality by interpreting frequencies that are ultimately projections from another dimension, a deeper order of existence that is beyond both space and time: The brain is a hologram enfolded in a holographic universe,” (Talbot, 1991, p. 55). Researchers have found that at the moment of ovulation there is a definite shift in the electrical fields of the body of the woman. The membrane in the follicle bursts and the egg passes down the fallopian tube. The sperm is negative with respect to the egg. When the sperm and egg unite, the membrane around the egg becomes hyperpolarized, shutting out other sperm. It is at this moment that the electromagnetic entity is formed. The fertilized egg cell contains all the information necessary to create a complete operational human being. The biohologram begins to function at conception and ceases only at death. Our contention is that the DNA at the center of each cell creates the multi-cellular creature hologram by expressing the DNA in the center of the cells. The biohologram projected by the embryonic nervous system forms a three-dimensional pattern of resonant structures. These include points, lines, and planes that electromagnetically behave as the acoustic waves - the material waves - of the drumhead, acting as field guides to flowing matter and energy. The Gariaev group has proposed a theory of the DNA-wave Biocomputer. They suggest (1) that there are genetic "texts", similar to natural context-dependent texts in human language; (2) that the chromosome apparatus acts simultaneously both as a source and receiver of these genetic texts, respectively decoding and encoding them; (3) the chromosome continuum acts like a dynamical holographic grating, which displays or transduces weak laser light and solitonic electro-acoustic fields. The distribution of the character frequency in genetic texts is fractal, so the nucleotides of DNA molecules are able to form holographic pre-images of biostructures. 3. processes in the substance-wave structures of the genome can be observed and registered through the dispersion and absorption of a bipolar laser beam. This process of "reading and writing" the very matter of our being manifests from the genome's associative holographic memory in conjunction with its quantum nonlocality. Rapid transmission of genetic information and gene-expression unite the organism as holistic entity embedded in the larger Whole. The system works as a biocomputer -- a wave biocomputer. The quantum nonlocality of the genetic information is fundamental. Experimental work of the Gariaev group shows how quantum nonlocality is directly related to laser radiation from chromosomes (light), which jitterbugs its polarization plane to radiate or occlude photons. The same researchers suspect the ability of chromosomes to transform their own genetic-sign laser radiations into broadband genetic-sign radio waves. Curiously, mystics have always called the pervasive creative sacred Sound, Logos or Word, the Audible Life Stream (Blavatsky, 1987; Hines, 1996). They declare the Light and the Sound are one, and holographic concept is another name for Unity. The polarizations of chromosome laser photons are connected nonlocally and coherently to polarizations of radio waves. The signal can be "read out" without any loss of the essential information in the form of polarized radio waves. The liquid crystal phases of the chromosome apparatus (laser mirror analogues) can be considered a fractal environment which stores the localized photons. This creates a coherent continuum of quantum-nonlocally distributed polarized radio wave genomic information. The genetic wave information from DNA, recorded within the polarizations of connected photons, being quantum nonlocal, constitutes a broadband radio wave spectrum. This spectrum is correlated by means of polarizations with the photons. This is the main information channel of DNA, the same for both photons and radio waves. This biocomputer memory and retrieval program features photon-laser-radiowave polarization spectroscopy. Complex dynamics are expressed as fractal patterns at all levels of organization in nature. And this is no exception. The fundamental notion is, that the photon-laser-radiowave features of different objects (the Fourier-spectra of the radiowaves of crystals, water, metals, DNA, etc.) are stored for definite but varying times by means of laser mirrors, such that the "mirror spectra" concern chaotic attractors with a complex fractal dynamics, recurring in time. This research is the first example of a novel static storage/recording environment (laser mirrors) capable of directly recording the space-time atomic/molecular rotary dynamical behavior of objects. It also demonstrates an essentially new type of radio signal, where the information is encoded by polarizations of electromagnetic vectors. This could even be the basis of a new type of still or video recording, leading to a new form of cinema. This newly detected phenomenon of quantized optical activity can be considered as the means by which an organism obtains unlimited information on its own metabolism. Such information is read by endogenous laser radiations of chromosomes. The chromosome, in turn, produces the regulative ("semantic") radio emission of the genome biocomputer. Semantic resonances in the biosystem's space are realized at both the wavelength level, and level of frequencies and angles of twist of the polarization modes. A gene has a holographic memory, (which is typically distributed, associative, and nonlocal), where the holograms "are read" by electromagnetic or acoustic fields. These carry the gene-wave information out beyond the limits of the chromosome structure. At this and subsequent levels, the nonlocality takes on its dualistic material-wave nature, as may also be true for the holographic memory of the cerebral cortex (Pribram, 1991). Pribram posits a neural holographic process, wherein images are reconstructed when representations in the form of distributed information systems are appropriately engaged. These representations operate as filters or screens. The temporary organization of cortical columns and the arrival of impulses at neuronal junctions converge from at least two sources, forming interference patterns. These patterns are made up of classical postsynaptic potentials, coordinated with awareness. This microstructure of slow potentials is accurately described by the equations that describe the holographic process which is also composed of interference patterns. From this it follows that in the brain information representing input is distributed over the entire extent of the neural pattern. In the bodymind information is also holographically distributed, each "part" having more or less information about the whole organism. Information is fractally distributed and present in greater or lesser resolution. A neural holographic or similar process does not mean that input information is distributed willy-nilly over the entire depth and surface of the brain. It is confined primarily to those limited regions where reasonably stable junctional designs are initiated by the input participating in the distribution. Holographic memory processing does away with the need for keeping track of where information is stored. The "filter," "sieve," or "screen" of holographic patterns is composed not only of the lattice of membrane macromolecules making up the synapto-dedritic net, but also of a facilitation of all tendencies toward Image formation and the initiation of certain departure patterns of nerve impulses (Pribram, 1971). At the junctional patterns of neural activity, Image forming capacity is enhanced. Superposition, i.e. spatial interactions among phase relationships of neighboring junctional patterns occurs, with properties akin to those of optical information processing systems -- the properties of holograms. Chaotic dynamics are part of this image-forming process. There is order even in disorder. There is order, manageable chaos (fractals) and unmanageable chaos. The fractal dimension expresses the complexity of a particular fractal form. “Fractal” comes from the Latin fractus, which mean broken or fragmented. Fractals delineate a whole new way of thinking about structure and form -- even the forms of dis-ease, which take root organically in the body and psyche. Like holograms, magnify a fractal again and again and more detail emerges from its infinitely embedded structure. The same self-similar patterns repeat, over and over, no matter what level you care to examine. You look closer and closer and still see the same form. A single image is infinitely reiterated. Thus, a wealth of structure emerges from simplicity. So, too, the dis-ease process can be seen at the physical, emotional, mental, and spiritual levels. Yet, the form remains the same. "At the most fundamental level of our individual being, we too, our bodies and our psyches are part of the interference patterns caused by the interaction of consciousness and wave fronts arising from fields of infinite possibility. We then must also operate by holographic principles, thus our internal perception of this reality is itself a hologram in our brain. It is the means of perception that gives the universe its apparent forms and solidity. It is also this holographic perception that influences the dynamics of our brain's and our body's chemistry, our self-hologram. In this perceptual hologram resides the fundamental basis of our structure and our sense of self and external environment, including our health and illness in both our physiological and psychological being. Our disease structures are incorporated within it. It is here, at this level of our being where fundamental healing and physical-psychic restructuring occur. This hologram is what I have termed the primal existential sensory self-image or existential hologram. . .our sense of self is a holographic, existential, multi-sensory image." (Swinney, 1999). The key to this process lies in our DNA, in our genes and gene-expression. Our understanding of the human biocomputer must be based on a new understanding of the higher forms of the DNA memory, and the chromosome apparatus, as the recording, storing, transducing, and transmitting system for genetic information, to be considered simultaneously at the level of matter and physical fields. The wave-biocomputer model helps explain the apparatus of protein biosynthesis of living organisms, providing an important interpretation of the initial stages within the hierarchic chain of material and field, sign, holographic, semiotic-semantic and, and figurative encoding and deciphering of chromosome functions. At the gene-sign continuum of any biosystem, DNA forms pre-images of biostructures and the organism as a whole as a registry of dynamical "wave copies" or "matrices", succeeding each other. This continuum is the measuring, calibrating field for constructing or creating any biosystem, (Gariaev). A quick review of the Holographic Concept refreshes us on the basics of biophysics. Particles found in biological processes include photons, electrons, protons, elementary ions, inorganic radicals, organic radicals, molecules, and molecular aggregates. Photons act upon electrons by raising their energy state. This process is called excitation. Excited electrons can drop back to more stable energy levels and emit photons. Electron excitation can lead to the formation of an electronic bond between molecules. This is the traditional bond of classical chemistry. The breaking of such bonds can, by reverse process, lead to the excitation of electrons. All cellular processes are driven by energy derived from the breaking of chemical bonds and the excitation of electrons. Depending upon the particular environment and circumstances, the excitation of the electron can be converted in one of three ways: (1) conversion into heat and dissipation (2) translation of molecules or ions through the cell, or (3) transformation of the molecules' shapes which profoundly influences their biological reactivity. The formation of a certain type of chemical bond known as the resonance bond (which is most easily seen in the case of the Benzene molecule) leads to a peculiar situation in which certain electrons are freed from a local or particular location in the molecule. These are then free to travel around the entire molecule. This means that the electrons occupy an energy shell of the whole molecule as opposed to any particular atom in the molecule. The existence of molecular systems with mobile electrons has been found to be of profound significance in the phenomena of life. Conjugate bonded molecules may interact in a variety of ways. Among these types of interaction can be found the interpenetration of electron orbitals which permits an electromagnetic coupling. This coupling can permit activated electron energy to pass from one molecule to another in the same way a radio can transmit a message to a radio receiver. There is also the possibility of the transfer of an entire electron which is known as charge transfer. It is possible for a molecular complex to contain several radicals at different positions on the main molecule, each of which are conjugated. If these are in close enough proximity, or can be brought into proximity by changes in the structural configuration of the molecule, a charge can pass between these two groups. This is the case of the transfer of electron charges on or around a single molecular complex. It has been suggested by Szent-Gyorgyi (1968) that the sugars and phosphates that make up the side of the alpha helix of DNA can permit the passage of electrons, functioning as a conductor. The biological conduction systems operate primarily on an amorphous semiconductor mode as opposed to resembling metallic conductors. These do not have sharply defined energy bands in which electrons may flow, as opposed to other bands in which they are bound rigidly. There is a spread or bell-curve in which the points or tails are bound more closely to a particular molecule. The hump indicates a conducting band that permits electrons to flow across the surface of a particular molecule or between molecules (McGinness, 1972). The biological activity or specificity of action of various molecules is intimately related to their structure or their exact three-dimensional spatial configuration. Electronic energy and electrons can move through a protein molecule between its different parts and can pass among different molecules. We now come to understand a possible mechanism for biological regulation involving flows of electrons and transfer of electronic energy between molecules. These can change their shape and thereby change their specific action and activity. The fusion of electron clouds can exist within a conjugated system and among conjugated systems. This can account for cohesion or the adherence of such molecules to each other. Such fusion is a very important determinate of the structure of larger aggregates of molecules and portions of living cells, such as membranes. A liquid crystal in a cell through its own structure becomes a proto-organ for mechanical and electrical activity, and when associated in specialized cells in higher animals gives rise to true organs such as muscles and nerves. The oriented molecules in liquid crystals furnish an ideal medium for catalytic action, particularly of the complex type needed to account for growth and reproduction. A liquid crystal has the possibility of its own structure through singular lines, rods and cones, etc. Such structures belong to the liquid crystal as a unit and not to its molecules which may be replaced by others without destroying them, and they persist in spite of the complete fluidity of the substance (Needham, 1936). Bernal's statement (1933) would seem to support Burr and Northrop's macro-atomic theory (1935), which postulates that there are two aspects to reality, the field and the particle. They associate the field with what they term the macroscopic aspect and the electron with the particle. They associate the field with what they term the macroscopic aspect and the electron with the particle. The particle is associated with movement. The structure of biological material seems to be associated with the field aspect. The electric field causes polarization of the macromolecules in the solution due to the fact that molecules possess a dipole moment, and changes the position of protons in the molecule. Such action can affect the relative stability of different possible configurations of the macromolecules. The field affects the degree of structure present in the solution. A constant magnetic field can, in principle, affect the various processes in biological objects. Three possible mechanisms for this biomagnetic affect are (1) the orientation of diamagnetic or paramagnetic molecules by the magnetic field (2) distortions of the angles in the molecules and (3) orientation of the spins of molecules in a magnetic field (Fowler and Bernal, 1933; Freedericks and Zolina, 1933; Van Iterson, 1933; Osborne, Ambrose and Stuart, 1970). Presman (1970) has postulated that such electromagnetic fields normally serve as conveyors of information, from the environment to the organism, within the organism, and among organisms. He suggests that organisms employ these fields in conjunction with the well known sensory, nervous, and endocrine systems, in effecting coordination and integration. Muses (1970) has proposed the possibility of unit impulse functions evolving from the Gaussian. His work traces the relation of that mathematical concept to quantum biological indeterminacy in terms of a process of the modulation of random fluctuations by target-seeking perturbations which points the way to the understanding and computing of the parameters of volitional experience in quantum biological terms. He maintains that we are dealing with Gaussian wave packets, put to use in terms of a close-range reaction in turn resulting in the resonant microbiological specificity (arising from the relatively large number of specific molecular parameters) necessary to the essential life and evolutional processes of chromosome synapses, replication, and mutagenesis. Tien (1969) has conceptualized mind as mass in relative motion and brain as energy at relative electrical charges in motion, like electrons bombarding a television screen, and personality is seen as a time series of scintillating frames of consciousness. Personality becomes a reverbating input-output pattern of self-creation, seeking information or patterns of energy from the environment as well as from its own memories. The stability of any given personality of its identity is maintained by feedback upon the principle of most similarity. We propose that the "reality hologram" which appears as a stable world of material objects is the elementary particle which has a long-term existence and fairly simple rules of interaction. We also propose the existence of a "biohologram" which appears as mobile and evolving, through the DNA molecule. This "biohologram" projects a dynamic three-dimensional image that serves as a guiding matrix for the manipulation and organization of the "reality hologram." (Miller, Webb, Dickson, 1973). Thus we have mobile self-organizing holograms moving through a relatively static simpler hologram. The possibility exists that such "bioholograms" could achieve sufficient coherence to continue existence as a pattern of radiant energy apart from a material substrate. We feel that such an occurrence could form the scientific basis of such psychoenergetic phenomena as psycho-kinesis, clairvoyance, telepathy, and precognition. Quantum holography asserts that DNA satisfies the principle of computer construction as defined by Von Neumann (1966). It carries a copy of itself and is its own blueprint written in the genetic texts where the mechanism engineering the DNA replication is the biophotonic electromagnetic field, while the "letters" of the genetic texts, A, G, C, U are held invariant. In replication of the organism, the blueprint creates the "acoustic field" which mechanically constructs/engineers the organisms out of the available matter, in accordance with the information held in the electromagnetic field holograms. Both quantum entanglement and therefore quantum teleportation can be related to quantum holography, through solitons, resonance effects, and superconductivity. Experimental evidence confirms that the mutual recognition of one DNA antiparallel half chain (+) by the other (-) concerns special super persistent/resonant acoustic-electromagnetic waves or solitons. DNA solitons express two types of memory which concern the capability of non-linear systems to remember initial modes of energisation and to periodically repeat them [Dubois, 1992]. The DNA liquid crystals within the chromosome structure form such a non-linear system. The DNA-continuum is quasi-holographic/fractal and relates, as is the case for any hologram or fractal, to the fundamental property of biosystems, i.e. their ability to restore the whole out of the part. DNA solitary waves (solitons), and in particular, the nucleotide waves of oscillatory rotation, "read" the genome's sign patterns, so that such sign vibratory dynamics may be considered as one of many genomic, non-linear dynamic semiotic processes. The key parameter of such patterns is fractality. It can therefore be hypothesized that the grammar of genetic texts is a special case of the general grammar of all human languages. We can realize the wave-coding capabilities of the matter-wave sign functions of DNA as true wave control capabilities facilitates in an aqueous solution acting as a liquid-crystal condition. The living cell is a computer based on DNA. The genome has been identified as an active "laser-like" environment. Yet this approach to DNA-wave biocomputation means entering into new semiotic areas of the human genome and the biosphere in general. These are the areas which are used by Nature to create humankind. The quasi-speech of chromosomes of all organisms concerns semantic exobiological influences wherein DNA acts as a kind of aerial open to the reception of internal influences and changes within the organism as well as those outside it. This extends beyond it to the extent of the entire universe through complex fractal embedding and non-locality. Creation of biocomputers can be based on these totally new principles of DNA-wave biocomputation, which use quantum teleportation [Sudbury, 1997], (see also SciAmer on quantum teleportation). Experiments show that DNA considered as a liquid-crystal gel-like state, reveals a periodically reoccurring pattern which acts on the incoming light in the manner of a solitonic lattice. What could such an action achieve? A soliton is an ultra stable wave train often with a seemingly simple closed shape, which can arise in the context of non-linear wave oscillations. Really it consists of a rather complexly interrelated assembly of sub wave structures, which keep the whole solotonic process in a stationary state over a comparatively long time. The soliton is neither a particle nor wave in much the same as a quantum is characterized by wave-particle duality. It is a means to carry information. It probably reads the codons, as a travelling "window" that opens in the double helix structure as the reading takes place. In this model the reading process is a complex mechanical oscillator (Gariaev, 1994), capable of producing solitonic wave transmissions, which take the form of a system of rotary pendulums. DNA forms such pendulums in this model which are simulated as a chain of non-linear oscillators. The window as it travels is highly context dependent on the actual layout of the elements as specified by the actual genetic code sequence involved. Complex dynamic patterns arise in the non-linear covalent connections between nucleotides. Oscillatory activities are located somewhere together in the "acoustic" wave domain. As a liquid crystal, DNA probably influences the polarization of the weak light emission known to exist in cells, as so-called biophotons. Such biophotonic, mitogenic radiation or mitogenic light, while being ultraweak, is yet highly coherent. It has an inherent laser-like quality. Endogenous intracellular coherent light is emitted by the DNA molecule itself. The superposed coherent waves of different types in the cells are interacting to form diffraction patterns, first in the "acoustic" domain and then in the electromagnetic domain. This is a kind of quantum hologram. Interactions of solitonic oscillations in the liquid crystal structure of DNA and the polarization vector of the ultraweak biophotonic highly coherent light, could be understood as a mechanism of translation between holograms in the "acoustic" frequency domain of short range effects and those in the electromagnetic domain, and vice versa. Quantum holography has been used to predict the workings of MRI (Schempp, 1992,1998). The DNA-wave biocomputer model is also in agreement with the qubit model explanation of DNA. In the quantum holographic DNA-wave biocomputer theory, DNA is a self-calibrating antenna working by phase conjugate adaptive resonance capable of both receiving and transmitting quantum holographic information stored in the form of diffraction patterns -- quantum holograms. The model describes how during the development of an embryo of the DNA's organism, these holographic patterns carry the essential holographic information necessary for that development. The quantum holographic theory requires that the DNA consists of two antiparallel (phase conjugate) helices, between which are located hologram planes/holographic gratings, where the necessary 3 spatial dimensional holographic image data of the organism is stored. Endogenous laser illumination can be expected to turn the DNA into a series of active adaptive phase conjugate mirrors/holographic transducers. A beam of radiation resonantly emerges on which is carried the holographic information as encoded in the DNA. This confirms the quantum holographic prediction that DNA functions as an antenna capable of both encoding and decoding holographic information. We can also model the quantum holography of the neuron. This model is in good accord with the biological neuron's information processing morphology and signal dynamics. This is the quantum holographic model of the brain as a conscious system. We can incorporate signal theory into quantum physics through the concept of the pilot wave or radar. Quantum holography predicts polarized or orthogonally rotated holograms encoded on a "paged" associative holographic memory. Sharp frequency adaptive coupling conditions specify very narrow spectral windows, i.e. the "pages." "Magic windows" are a naturally tuned frequency of a good hyperchannel between orthogonal frames where scalar wave anenergies crosstalk readily. They are frequency dependent interdimensional nodal points. Some magic windows are 38-40 lHz; 150-160 kHz; 1.1-1.3 MHz; 1.057 (Lambshift) and the near ultraviolet (life energy frequency), (Beardon, 1988). Described in terms of tensor multiplication, the orthgonality condition can be seen as specifying a set of diagonal elements, which traces in a unit matrix in the frequency domain. The planes on which the base pairing takes place concerns two quantum holograms. The tensor operation, in quantum holography, describes a quantum entanglement. Murray Gell-Mann describes quantum entanglement in The Quark and the Jaguar (1994). He first points out that coarse graining can wash out interference terms. The interference terms between two coarse-grained histories is the sum of all the interference terms between pairs of fine-grained histories belonging to those two coarse-grained ones. The underlying explanation for decoherence is the mechanism that makes interference terms sum to zero and permits the assignment of probabilities. It is the entanglement of what is followed in the coarse-grained histories with what is ignored and summed over. There are only a few known forces in nature and unfortunately we are at a loss to explain what their actual sources are. The best physics has been able to do is ascribe them to some fundamental characteristics of the universe, a charge of some kind. That's why we can more abstractly view a force as the variation of a certain potential and therefore practically every influence field can be thought of as a force field. This potential can be a scalar as in the case of Coulomb's law; a vector as in the case of the electromagnetic vector potential which neatly streamlines the mathematics of Maxwell's equations; or a tensor, which is the case of the metric tensor of the Riemann space in Einstein's GTR equations. There is a predominance of non-linear processes in biological systems. Several types of quasi-particles, each with their own characteristic resonant frequencies have been proposed to mediate these non-linear phenomena, including solitons, excitons, and plasmons. The right frequencies of non-linear energies might have profound healing properties, according to Stanford researcher Dr. Glen Rein. Due to the non-linear nature of biological systems it is proposed that scalar waves should be more biologically active than their linear electromagnetic counterparts. In the simplest cases, scalar resonance can be imagined as two ordinary single-frequency EM standing waves in a resonant cavity, with the two waves coupled exactly 180 degrees out of phase so that --externally--their E fields sum to zero and the capacity is said to be in scalar resonance. The cavity walls must act as phase conjugate mirrors (PCM). Mass itself is simply a standing scalar resonance, with the standing walls tapped by particle spin. The atomic nucleus continually bombarded by virtual photon flux from the vacuum is a pumped PCM. Since the nucleus is positively charged, it produces Phase Conjugate Replicators (PCRs), having negative energy and negative time. It thus produces negentropy, which prevents the entropic decay of the atom. Essentially all frequencies can be and are present at once, but certain nuclear resonance frequencies are thought to predominate. By increasing the amplitude of the standing scalar wave that is the nuclear pseudopotential, inertia and mass of the nucleus are increased. Zeroing the amplitude dematerializes the nucleus. (Beardon, 1980). So, scalar energy is transduced into linear electromagnetic energy in the body by liquid crystals in the cell membrane and solid crystals found in the blood and in several biological tissues. Clinical studies of the effects of scalar energy on the mind-body and brainwaves have been conducted since the 1980s. If they can be believed, research from Stanford University Medical Center produced some tantalizing results. Electrochemical oscillation between membrane-bound lipids near phase-transition temperature have been analyzed with and described by nonlinear quantum mechanical equations. They also analyzed the coupling between harmonic oscillators represented by action potentials generated from active neuronal networks in the central nervous system, finding evidence of chaos. The extraction of scalar components from Maxwell's original electromagnetic equations and from Schrodinger's equation using imaginary numbers has been reported, and their unusual non-linear waves described by many experimenters. A Crystalline Transduction Theory has been put forth to explain the interactive mechanism of scalar waves with biological systems. Another possibility is transduction in microtubules dispersed throughout the whole organism. Tissue culture studies imply that the action of scalars on biological systems is more than a placebo effect mediated by the brain/mind, such as stress, moods or beliefs. Stray EM energy in the ambient atmosphere makes it difficult to study the healing properties of scalar energies in a clinical setting. Clinical healing sometimes occurred several months after initial exposure to the scalar waves. It is known that the brain and body, each the immune system, communicate bidirectionally. Thus, a direct action of scalar energy on the body could cause a subsequent change in brain state. Therefore EEG studies do not indicate whether scalar energy also effects the body directly or whether the brain and the body are both affected. Even if scalar energy directly affects individual cells, it may also affect the mind resulting in an altered psychological outlook which results in clinical improvement. Dr. Michael Persinger (1987) was the first person to test the effects of scalar energy using isolated cells. The scalar waves were generated by partially canceling two vortex-type magnetic fields (0.SHz, 10pT) by intersecting them in the air. The biological endpoint, degranulation of mast cells, was increased by the scalar fields. Dr. Puharich, in another study, grew tissue samples of E. Coli, and detected an increased activity of ubiquitone, a protein involved in DNA repair. These results indicate that scalar energy can have a direct effect at the subcellular level as well as a direct effect on the immune system. Another project detected an effect of scalar energy on neurotransmitter function, which mimicked the effect of antidepressant medication. Scalars appear to modulate the basic biochemical communication between nerve cells mediated by neurotransmitters. Cultured nerve cells called PC 12 cells were isolated from rats, and the functional properties of noradrenaline release from PC 12 cells was shown to be increased by a 500Hz monopolar square wave, and noradrenaline uptake was inhibited by a 15Hz biopolar square wave, (Rein). Noradrenaline uptake was chosen because it is directly mediated by the plasma membrane via an intramembrane protein carrier. The plasma membrane, with its liquid-crystal structure, is the critical cellular barrier which interfaces with the chemical and electromagnetic environment. Since other intramembrane proteins show non-linear properties, the plasma membrane is a likely target for scalar energy. The physiological function of carrier mediated neurotransmitter uptake is to remove excess neurotransmitter from the synaptic cleft after its release from presynaptic nerves. Thus, inhibiting uptake results in the accumulation of the neurotransmitter in the synaptic cleft. This is the mechanism of action of tricyclic antidepressants, since they inhibit noradrenaline uptake. Depression is associated with decreased noradrenaline levels. Rein exposed confluent monolayer culture of PC12 cells to noradrenaline in the presence or absence of scalar energy. After 30 minutes, the cells were washed and centrifuged and noradrenaline uptake measured. Overall, uptake was inhibited by 19.5% in the presence of the scalar field as compared with the control value obtained in its absence. This is a significant statistical difference of p 0.01. Researchers think a wide variety of physiological changes could be created resulting in improvement of a variety of clinical diseases, only one of which could be depression. Scalar energy can have a direct effect on the cell membrane. Researchers want to test whether diseased cells are preferentially sensitive to scalar energy; and what characterizes its mechanisms of action. Rossi (1999) describes a mind/body communication channel that is pertinent in that it may describe another way neural plasticity and healing manifests from REM. He describes how immediate-early genes (also called “Primary Response Genes” or third messengers) play a central role in the dynamics of waking, sleeping, dreaming, and mind-body healing at the cellular level. Behavioral states modulate certain patterns of gene expression. Interaction between the genetic and behavioral levels is a two way street. Genes and behavior are related in cybernetic loops of mind-body communication. How does this relate, for example, to manic depression? A look at the systems related to IEGs, shows that they affect all the systems disrupted in bipolar disorder. They are expressed continually in response to hormone messenger molecules mediating processes of adaptation to extracellular signals and stimuli. Extracellular stimuli come from the outside environment, including temperature, food, sexual cues, psychosocial stress, physical trauma, and toxins. IEGs are fundamental in the sleep-wake cycle, appetite regulation, sexual response, and reactions to stress, trauma, and toxins (Rossi, 1986; 1999; 2002). There are persistent alterations in IEG expression in the process of adaptive behavior on all levels from the sexual and emotional to the cognitive. They can transduce relatively brief signals from the environment into enduring changes in the physical structure of the developing nervous system as well as its plasticity in the form of memory and learning throughout life. If external cues can modulate cell function through regulation of gene expression, this could also be true for internal cues. IEGs are also fundamental in the regulation of REM-on, REM-off neurons, neuronal networks that are associated with REM sleep and dreaming. That makes them significant as molecules which can modulate mind, emotions, learning and behavior. They influence the rhythm of the natural healing process and circadian and ultradian rhythms of the body, in general. Ultradian rhythms are those shorter than the 24-hour circadian rhythms (Rossi; Cheek, 1988). Milton Erickson discovered that his therapy sessions usually took from one and a half to two hours to come to natural closure. Later it was discovered that this delineates the natural work cycle that is harmonious with our own internal rhythms. IEGs modulate this process. This ultradian time frame is related to the activation or deactivation of the expression of specific genes and can occur in a matter of hours or even minutes. “Most arousing environmental stimuli that have been studied can induce immediate-early genes within minutes, their concentrations typically peak within fifteen to twenty minutes and their effects are usually over within an hour or two. These time parameter IEG expressions and their ultimate translation into the formation of new proteins correspond to the parameters of a complete work cycle of mind-body communication and healing. The changes in gene transcription and new protein formation initiated in this time frame, however, can lead to lasting changes in the central nervous system by converting short term memory to long lasting learning by the process of long term potentiation. . .the activation or deactivation of the expression of specific genes can occur in a matter of hours or even minutes." (Rossi, 1999). This mechanism assesses the duration and intensity of prior waking and/or the homeostatic or executive mechanisms that bring about sleep. Sleep deprivation leads to a wide variety of psychotic and non-psychotic symptoms. This system is also associated with the neuronal network associated with the dynamics of REM sleep. Deprivation of REM and dreaming creates its own phenomenology. “The study of IEGs indicates that sleep and wake, as well as synchronized and desynchronized sleep, are characterized by different genomic expressions, the level of IEGs being high during wake and low during sleep. Such fluctuation of gene expression is not ubiquitous but occurs in certain cell populations in the brain. Thus...IEG induction may reveal the activation of neural networks in different behavioral states. Do the areas in which IEGs oscillate during sleep and wake subserve specific roles in the regulation of these physiological states and a general ‘resetting’ of behavioral state? Is gene induction a clue to understanding the alternation of sleep and wake, and of REM and non-REM sleep?” (Rossi, 1999). Enriched internal and external environments leads to the growth and development of new cells. IEG cascades lead to the formation of new proteins and neurons along with increased synapses and dendrites that encode memory and learning. On the other hand, excessive trauma and psychosocial stress can lead to suppression of growth processes in the brain. When psychotherapy contributes to arousal, enrichment, and relaxation it facilitates actual growth in the brain to encode new memory, learning and behavior, optimizing growth and healing. “Communication within the neuronal networks of the brain is modulated by changes in the strengths of synaptic connections...meaning is to be found in the complex dynamic field of messenger molecules that continually bathe and contextualize the information of the neuronal networks in ever changing patterns. Most of the sexual and stress hormones...have state dependent effects on our mental and emotional states as well as memory and learning, a constantly changing dynamical field of meaning.” (Rossi, 1991). Novel and enriching psychotherapeutic experiences can lead to neurogenesis and gene expression which facilitate mindbody communication and can have a long-term transformative effect on the whole person (Rossi, 2002). Rossi points out that many of the essential dynamics of gene expression involved in the formation of the brain and body in embryology are now recognized as a continuing creative development through an individual's lifetime. He also asserts that a lack of optimal gene expression and neurogenesis is associated with psychological depression and stress. Thus, bioholography has relevant applications for optimizing health and well-being across disciplines, such as biophysics, medicine, psychobiology, psychotherapy and the holistic healing arts. Since the early '90s, Gariaev's team has been developing a new theoretical and experimental approach to the study of genetic material encoding and expression. In a pioneering paper (Gariaev 2001; JNLRMI I(2)), he and his colleagues challenge the limits of the genetic code triplet model and propose instead a dual, substance/wave basis for the encoding and expression of genetic material. The wave-like, non-local aspect of genetic regulation is recorded at the polarization level of DNA-associated photons, and the genome is seen as a quasi-hologram of light and radio waves which create the background necessary for the appropriate expression of genetic material. The authors argue that the genome emits light and radio-waves whose delocalized interference patterns create calibration fields (blueprints) for a system's space-time organization. This holographic-type information is being constantly and simultaneously read in billions of cells, accounting for the quick coordinated response typical of living systems. Gariaev asserts that quantum nonlocality and holography is indispensable to a proper explanation of such real time working. Quantum Holography defines an admitter/absorber quantum vacuum model of quantum mechanics in terms of annihilation/creation operators [Schempp, 1993]. This implies that DNA does indeed behave like a single quantum, which induces a "hole" temporarily in the vacuum by its removal. This new understanding of biocomputers, constitutes a further step in a development of computer technology in general. An understanding that brings about a total change of the constituent basis of that technology to the figurative semantic (nonlocal) wave computer or biocomputer, based on DNA memory, and the chromosome apparatus. Quantum Bioholography argues that DNA satisfies the principle of computer construction, since it carries a copy of itself, its own blueprint, with the mechanism engineering the DNA replication being the biophotonic electromagnetic field, while the "letters" of the genetic texts A, G, C, U are held invariant. The existence of the genetic text constitutes the classical signal process of quantum teleportation, and facilitates the quantum mechanical signal processes of both the copying of the DNA as its own blueprint, and of the construction of the organism in a massively parallel way by means of quantum teleportation. 1. Beardon, Thomas (1980, 1988, 2002), Excalibur Briefing, Strawberry Hill Press, San Francisco. 2. Berezin, A.A., Gariaev, P.P., et al (1996), "Is it possible to create laser based on information biomacromolecules? ", Laser Physics, v.6, N6, pp. 1211-1213. 3. Blavatsky, H.P. (1987, 1992), The Voice of the Silence, Theosophical Publishing, Wheaton: Illinois. 4. Bohm, David (1980) Wholeness and the Implicate Order, Routledge, London. 6. Gariaev, P.P. (1994), Wave Genome, Public Profit, Moscow, 279 pages [in Russian]. 7. Gariaev, P.P. (1993) Wave based genome, Depp. VINITI 15:12. 1993, N 3092?93, 278pp. [in Russian]. 8. Gariaev, P., Tertinshny, G., and Leonova, K. (2001), "The Wave, Probabilistic and Linguistic Representations of Cancer and HIV," JNLRMI, v.1, No.2. 9. Gell-Mann, Murray (1994) The Quark and the Jaguar, New York: W. H. Freeman and Company. 10. Hines, Brian (1996), God's Whisper; Creation's Thunder, Threshold Books, Brattleboro, Vermont. 11. Kelleher, Colm A. (1999), “Retrotransposons as Engines of Human Bodily Transformation,” Journal of Scientific Exploration, 13, no 1, Spring 1999, pp. 9-24. 13. LeShan (1969), Toward a general theory of the paranormal. Parapsychological Monographs, No. 9. 14. Marcer, P. and Schempp, W. (1996), A Mathematically Specified Template for DNA and the Genetic Code, in Terms of the Physically Realizable Processes of Quantum Holography, Proceedings of the Greenwich Symposium on Living Computers, editors Fedorec, A. and Marcer, P., 45-62. 15. Marcer, P. and Schempp, W. (1997a), The Model of the Prokaryote Cell as an Anticipatory System Working by Quantum Holography, Proceedings of CASYS 97, 11-15, August, HEC-Liege, Belgium, International Journal of Computing Anticipatory Systems, v2, 307-315. 16. Maslov, M.U. and Gariaev, P.P. (1994), Fractal Presentation of Natural Language Texts and Genetic Code, 2nd Intl Conference on Quantitative Linguistics, Sept. 20-24, Moscow State University, Philological Faculty, pp. 193-194. 17. McFadden, Johnjoe (2002), “Synchronous Firing and Its Influence on the Brain’s Electromagnetic Field: Evidence for an Electromagnetic Field Theory of Consciousness,” (CEMI Theory), Journal of Consciousness Studies (2002) 9: 23-50. 18. McGinness, J.E. (1972), Mobility Gaps: A mechanism for band gaps in melanins. Science, 1972, 177, 896-897. 19. Miller, R.A., Webb, B. Dickson, D. (1975), “A Holographic Concept of Reality,” Psychoenergetic Systems Journal Vol. 1, 1975. 55-62. Gordon & Breach Science Publishers Ltd., Great Britain. 20. "Holographic Concept" was later reprinted in the hardback book Psychoenergetic Systems, Stanley Krippner, editor. 1979. 231-237. Gordon & Breach, New York, London, Paris. It was reprinted again in the journal Psychedelic Monographs and Essays, Vol. 5, 1992. 93-111. Boynton Beach, FL, Tom Lyttle, Editor. 21. Miller, R. A., Webb. B., “Embryonic Holography,” Psychoenergetic Systems, Stanley Krippner, Ed. Presented at the Omniversal Symposium, California State College at Sonoma, Saturday, September 29, 1973. Reprinted in Lyttle's journal Psychedelic Monographs and Essays, Vol. 6, 1993. 137-156. 22. Miller, R.A.(1974), "Bioluminescence, Kirlian Photography and Medical Diagnostics"; Mankind Research Unlimited, a formerly unpublished, proprietary paper. 23. Miller, Iona (1993), “The Holographic Paradigm and the Consciousness Restructuring Process,” Chaosophy ‘93, O.A.K., Grants Pass. 24. Miller, R.A. and Miller, Iona (1983), The Holistic Qabala, O.A.K. Grants Pass, Oregon. 25. Muses, C. (1970), On the modification of random fluctuations by a target-seeking process utilizing random energies. Bio-medical Computing, 1, 75-80. 26. Needham, J. (1936), The Hierarchial Continuity of Biological Order, Oder and Life, 1, 109-168. 27. Patel, A. (2000), Quantum Algorithms and the Genetic Code, Proceedings of the Winter Institute of Quantum Theory and Quantum Optics, 1-13 January, S.N. Bose National Centre for Basic Sciences, Calcutta, India. 28. Pearce, Joseph Chilton (2001), The Biology of Transcendence: A Blueprint of the Human Spirit, Inner Traditions, Rochester, Vermont. 29. Persinger, Michael A (1987), Neuropsychological Bases of God Beliefs, Praeger Publishers, New York. 30. Poponin, Vladimir, “The DNA Phantom Effect: Direct Measurement of A New Field in the Vacuum Substructure. 31. Presman (1970), Electromagnetic Fields and Life. New York: Plenum. 32. Pribram, Karl (1971), Languages of the Brain, Prentice-Hall, Inc., Englewood Cliffs: New Jersey. 33. Pribram, Karl (1991), Brain and Perception: Holonomy and Structure in Figural Processing, Lawrence Erlbaum Associates, Publishers, Hilldale: New Jersey. 34. Pullman and Pullman (1963), Quantum Biochemistry, New York: Interscience, 1963. 35. Puri, Lekh Raj (1964), Mysticism: the Spiritual Path, Radha Soami Satsang Beas, India. 36. Rossi, Ernest (1986) The Psychobiology of Mind-Body Healing: New Concepts of Therapeutic Hypnosis, W.W. Norton & Co; New York. 37. Rossi, Ernest and Cheek, David (1988), Mind-Body Therapy: Methods of Ideodynamic Healing in Hypnosis, W.W. Norton & Co., New York. 38. Rossi, Ernest (1999); “Sleep, dream, hypnosis and healing: behavioral state-related gene expression and psychotherapy,” in Sleep and Hypnosis: An international Journal of Sleep, Dream, and Hypnosis, 1:3, 1999, pp. 141-157. 43. Rossi, E. (2002). The Psychobiology of Gene Expression: Neuroscience and Neurogenesis in Hypnosis and the Healing Arts. New York: W.W. Norton Professional Books. 45. Schempp, W. (1992), "Quantum Holography and Neurocomputer Architectures", Journal of Mathematical Imaging and Vision, 2, 279-326. 46. Schempp, W. (1993) "Bohr’s Indeterminacy Principle in Quantum Holography, Self-Adaptive Neural Network Architectures, Cortical Self-organization, Molecular Computers, Magnetic Resonance Imaging and Solitonic Nanotechnology", Nanobiology 2, 109-164. 47. Schempp, W. (1998), Magnetic Resonance Imaging, Mathematical Foundations and Applications, John Wiley, New York. 48. Shcheglov, V.A., Gariaev, P.P. (1996) Laser-laser interactions and phantom effects in genetic structures. “Science on the threshold XXI age - New Paradigms” [in Russian]. for human potential science. The Journal of Non-Locality and Remote Mental Interactions Vol I. Nr. 2, online at http://www.emergentmind.com. 50. Singh, Charan (1979), Die To Live, Radha Soami Satsang Beas, India. 51. Strassman, Rick (2001) DMT: The Spirit Molecule: A Doctor's Revolutionary Research into the Biology of Out-of-Body, Near-Death, and Mystical Experiences, Park Street Press, Rochester, Vermont. 52. Sudbury, T. (1997), The Fastest Way From A to B, Nature, 390, 11th December, 551-552. 53. Swinney, Graywolf (1999), Holographic Healing, Asklepia Publishing, Wilderville: Oregon. 54. Szent-Gyorgyi (1957) Bioenergetics. New York: Academic Press. 55. Szent-Gyorgyi (1960), Introduction to a Submolecular Biology. New York: Academic Press. 56. Talbot, Michael (1991), The Holographic Universe, Harper Collins Publishers, New York. 57. Tien, H.C. (1969), Pattern Recognition and Psychosynthesis. American Journal of Psychotherapy, 23, 53-66. 58. Von Neumann, J. (1966), Theory of a Self-Reproducing Automaton, University of Illinois Press, Urbana and London.